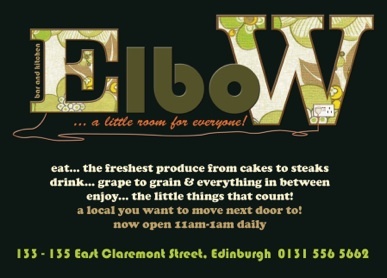 ElboW Bar and Kitchen might sound like a hip, minimalist gastro-pub, but its location across the road from Broughton Primary School ensures that it's a child-friendly spot where you can enjoy an afternoon tea or late lunch when the school bell rings . Children aren't allowed to eat in the bar area, but the mezzanine level offers plenty of tables to enjoy their wide selection of bistro-style food while playing one of their equally wide selection of games. Their menu changes regularly to suit the season, along with daily changing specials. The friendly staff are always willing to give advice, or make small changes to the dishes on the suggestion of regular customers. On this occasion I had the daily pie, a chicken, leek and tarragon middle with a puff pastry lid and accompanied by buttery mash and vegetables. The chicken pie was seasoned perfectly, but the advertised vegetables arrived in the form of a salad. As I was expecting a more classic green bean or carrot accompaniment, the salad was a little unexpected. However, it did offset the richness of the pie and mash very well. They offer safe and predictable options for children which will be familiar with most parents: macaroni cheese, burger, fish dippers, or garlic bread with cheese. They're also amenable to doing smaller portions of adult meals, if your little people fancy being a bit more adventurous. And if you feel like a treat afterwards, try their version of the English classic Eton Mess. Elbow Mess is a deliciously sticky treat of meringue, cream and strawberries. Perfect to finish off a meal while you conclude a game of Cluedo.